Summon: Give creatures in your deck +1/+1. 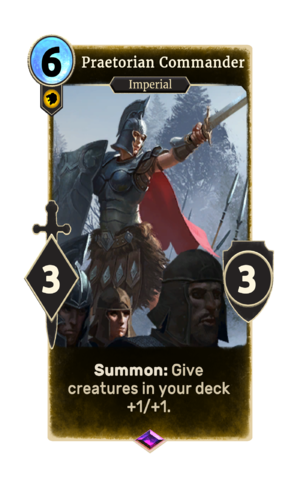 Praetorian Commander is an epic Willpower creature card. It is part of the Heroes of Skyrim expansion. "Don't let 'em break our lines!" This card's summon ability applies the Legion Discipline card effect. Prior to July 2017 and Update 65.2, the card gave creatures +2/+2 rather than +1/+1. This was nerfed because developers felt that it created "one-sided games". This page was last modified on 27 February 2019, at 22:42.